News / Industry 4.0 solutions for compounding extruders｜MITSUBA MFG.CO., LTD.
(Hannover, January 9, 2019) State-of-the-art data acquisition, processing and analysis can significantly simplify the daily production routines of compounding companies and provide valuable in-depth information for process optimization. This is why Hannover-based KraussMaffei Berstorff GmbH offers two highly innovative solutions for all twin-screw extruders of the new ZE BluePower generation. This enables perfect integration of advanced compounding equipment with industry 4.0 technologies. In order to meet the ever increasing demand for data acquisition and analysis, KraussMaffei Berstorff has developed two new systems, which are now available as options for ZE BluePower extruders. The first of these developments is designed to synchronously collect all production data of a compounding line. It is composed of perfectly tuned hardware and software components for acquisition, recording, evaluation and further processing of all process and measured values. Data analysis provides a sound basis for process optimization, in particular when it comes to process modifications or planned quality improvements. Thanks to its modular design and easy configuration, the system can be adapted to a wide range of different applications, scaled in size and is suited for interface-independent operation. All interfaces can be integrated into an overall system that collects and visualizes the desired process data. Pressure, temperature, speed and volume flow values of all upstream and downstream components - e.g. metering systems, melt filters, melt pumps and pelletizing systems - as well as the extruder parameters are combined in a single system. The second development for in-line process monitoring is designed to detect instantly any metering errors in order to reduce production scrap and enhance line efficiency. This in-line measuring system is based on color measurement: light is projected into the melt, reflected and then detected by a high-resolution glass fiber sensor. Upon comparison with the previously defined setpoint, any deviation in terms of brightness or color is instantly recognized and indicated. It goes without saying that the color measuring system can be integrated into the overall line control. 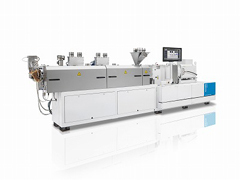 The ZE BluePower twin-screw extruder series is characterized by high energy efficiency, uncompromising safety at work, simple use and low maintenance efforts. It perfectly meets the ever increasing requirements of compound processors in terms of flexibility and cost effectiveness. Thanks to the unique interaction between the 1.65 OD/ID diameter ratio and the specific torque of up to 16 Nm, volume- and throughput-limited formulations can be compounded on a single machine. The special highlights of the ZE BluePower extruders are oval liners, improved side feeders and degassing units as well as the optional energy management tool. The 4D and 6D barrel sections that can be combined with the extensive range of modular screw elements to create bespoke machinery configurations for any application are simply unique in the market.